< Sophie at 6 months of age. For this photo, Sophie was an excellent model because Desiree could hold up a piece of food and direct her gaze. © photo by Desiree. Allex Michael: Except when guarding the house from coyotes, Ebbey is a couch potato indoors. However, she turns into a wild hunting dog outdoors. Her strong scenting instincts overpower any training. This is great for filming her as a search dog, but not so great as a regular pet or when trying to pass obedience training qualifications for a search dog. Ridgebacks are not recommended for first time dog owners and you must be physically strong enough to control them when they are in full tracking mode. Ebbey drinks from a mountain lake on a hot summer day. > The canine actor plays a search dog in the new film SEARCH DOG'S RAVEN: the Eerie Story of a Wilderness Search Dog Team. 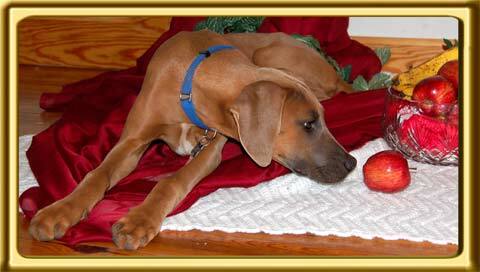 Regarding your dog's socialization, ridgebacks are one of the only hunting dogs that will protect their owner and property. Ebbey's exact age is unknown, but her protection attitude for property kicked in when she was over two years old. We adopted a rescued Rottweiler about a year after adopting Ebbey, so this may have also been an influence. Ebbey is quite friendly, with dogs and puppies, but will bark back at a vicious, menacing or barking dog if walking with another canine. 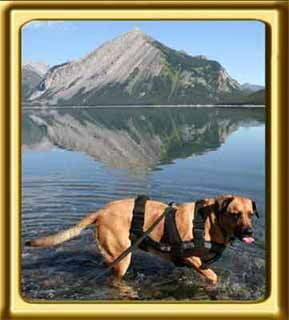 This is normal ridgeback pack hunting mentality. However, her intense hunting instincts lead to her play stalking. So instead of walking over and wagging her tail when meeting a strange dog, she drops down in the grass for an ambush or approaches with a lowered head. This can be quite alarming to the new dog who does not realize the 80 pound ridgeback cross is PLAY stalking. Most golden retrievers are smart enough to realize she is playing. Adopting Ebbey as a young adult, and with her overall bad behavior, I may have missed a ridgeback adolescent freaky stage. She still often acts like a large naughty puppy.